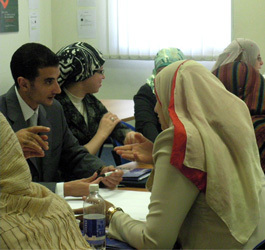 In 2008 and 2009, UNICRI hosted the project Human Rights Capacity Building in Egypt, jointly organized by the Government of Egypt and the UNDP. The project aimed to provide Egyptian law enforcers, judges, media professionals and NGO operators with a better understanding of issues related to human rights. A series of study tours was organized by UNICRI Headquarters in the United Nations Campus in Turin. The course paid special attention to the practical application of human rights in international cooperation, criminal investigations and criminal courts, prison administration, NGOs and the media. The 10-day study tour programme featured lectures and interactive workshops on human rights and the United Nations fundamental role in promoting their respect, along with a moot court and visits to a wide variety of national institutions, including criminal courts, prisons and police stations. Participants during an introductory brainstorming session/guided discussion on human rights, and the practical relevance of United Nations standards in the field of human rights.